As an attorney, Breean Beggs had a reputation for using lawsuits to change policy. Now on the city council, he has a chance to influence policy directly. With only three months on the job, Breean Beggs is the greenest member of the Spokane City Council. But in another sense, he's had his hands in Spokane's messiest debates for longer and deeper than any other councilmember. As the former director of the Center for Justice, he's been at the forefront of the "Smart Justice" movement to fix problems with courts and cops. He was the lawyer who fought for the family of Otto Zehm — the mentally disabled janitor who died after being beaten by police a decade ago — whose civic outcry led to the creation of Spokane's independent police ombudsman. "When I was at Center for Justice, I called myself the 'chief catalyst,'" Beggs says. "That is my thing. That's my purpose in life." • The independent police ombudsman hasn't yet conducted independent police investigations. In response, Beggs' plan would attempt to give the ombudsman more flexibility by removing one of the office's powers. • Property crime rates are out of control in Spokane. Beggs' plan to fix that hinges on sending fewer thieves to state prison and keeping more in Spokane. • A swarm of lawyers has prevented the release of crucial documents to an investigator hired to examine the ousting of former police Chief Frank Straub. Beggs' plan to resolve this relies on hiring yet another lawyer. These ideas don't aim to untangle Spokane's knottiest problems so much as attempt to slip through the tangles, finding the loopholes in the bureaucratic structures and partisan dogmas. "I think too often in the political theater, it becomes good people vs. bad people," Beggs says. "And it's not. It's all good people, trying to do good things." Beggs credits this in part to his upbringing, split between a hippie dad and an evangelical Christian mom. "I can talk to both of them in their languages and in their values. I've found I can do that in the wider world," Beggs says. "Being able to do that — that's what I think leads often to these third-way solutions." The problem: In February 2013, voters overwhelmingly passed an initiative allowing the police ombudsman to conduct his own independent investigations. But despite all the controversies that have descended upon the police department — including multiple police shootings — the ombudsman has never used this voter-established power. Part of the unwillingness to use this power, Beggs surmises, is the right that police unions in Washington state possess to bargain over anything affecting their working conditions. "Ironically, it means that police oversight is a lot easier in cities in right-to-work states, like Boise," Beggs says. The current union-bargained ombudsman ordinance allows the ombudsman to ask questions during internal affairs investigations. But they're only allowed to certify whether the IA investigation was "timely, thorough, and objective," and can't impact discipline. Critics see the current role of the ombudsman as seriously watered down. Beggs' plan: Take away the ombudsman's right to ask questions in internal affairs investigations. This, Beggs says, would remove the union's argument that the ombudsman is impacting working conditions. The ombudsman's role could then be strengthened, he argues, without worrying about triggering an unfair labor practices complaint. To Beggs, the purpose of the ombudsman should be less about certifying whether officers followed departmental policies, and more about identifying what happened after, say, an officer-involved shooting, and what the department can learn from it. "The question is, how can we prevent this in the future?" Beggs says. "Is there anything we could have done that would have likely prevented the death of that citizen without unreasonably endangering that officer?" The hurdles: Beggs says the city council has the power to change the ombudsman ordinance itself, but he wants the support of all the important stakeholders. So far, they're not all convinced. Bart Logue, the interim police ombudsman, has serious concerns that one of the ombudsman's best tools for accountability would be lost if Beggs' plan goes through. "The only way we can get part of the story thoroughly is through the internal affairs process," Logue says. "If we take ourselves out of that, what oversight are we doing?" Lt. Dave McCabe, president of the Spokane Police Lieutenants and Captains Association, echoes that concern. "I just don't see how you can maintain the same level of accountability and transparency if you take the ombudsman out of the process he's been involved in for the last four or five years," McCabe says. Beggs recognizes that many of the cops like the current system, but argues that they, too, want to restore the community's faith in the police department. "The relationship between the police department and the community appears to continue to be broken," Beggs says. The problem: For two years in a row, Washington state has had the worst property crime in the nation. It's the only state that releases most of its property crime offenders from prison completely unsupervised. In Spokane, the problem is particularly bad. "The state is spending $40,000 a year for each person they have in their prisons," Beggs says. "But we know for a fact — through data — they're not any better when they come out. In fact, they're worse." While spending that money on treatment, employment skills, housing and mental health care is much more effective, "we don't have local money to pay for that," Beggs says. Beggs' plan: Beggs wants to ask the state to give Spokane County half the money they're spending on certain inmates. Instead, that $20,000 would put those property crime offenders on electronic home monitoring instead of in jail, and fund housing, supervision and evidence-based rehabilitation programs. "The state [would be] saving 50 percent because they're not housing them in prison," Beggs says. "The data says that it works." The hurdles: It would require the state legislature to pass a bill, in a current environment in Olympia where even popular proposals can easily slip through the cracks. While Beggs says he already has support from local Democrats like Sen. Andy Billig, much of the fate of a proposal would rest in the hands of Spokane Valley Sen. Mike Padden, chair of the Senate Law and Justice Committee. 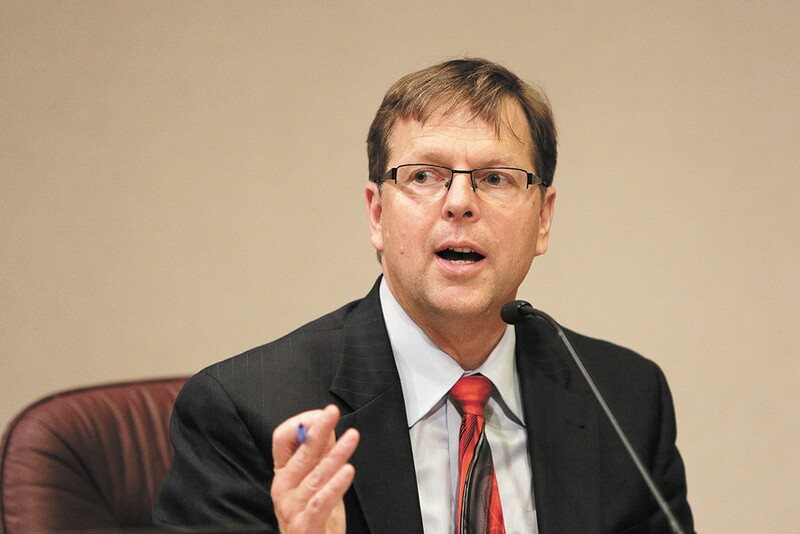 Padden has had a more traditionally punitive outlook to criminal justice than Beggs — he's been pushing a bill allowing prosecutors to more easily seek longer jail sentences. But Padden says he's open to Beggs' proposal, depending on which criminals it applies to. "I guess the devil is in the details," he says. "I'd also, frankly, want to hear what law enforcement and [County Prosecutor] Larry Haskell would have to say." The problem: After nearly six months of former federal prosecutor Kris Cappel's investigation into the city's decisions surrounding Straub's ouster, the city — in the midst of defending itself from Straub's lawsuit— still refuses to hand over certain key documents. Not only that, but city attorneys have refused to answer Cappel's questions. Beggs parachuted into the mess at the end of February, when he joined the joint investigative committee overseeing the investigation. Talking with city legal staff, he realized the sticking point was the question of "attorney-client privilege." Beggs respects that. "You don't get to know what the client told the attorney," Beggs says. "We say it's better to protect that basic human right than to get to the truth. That's in our culture, our legal DNA." But he still believes that the public deserves to know the truth. Beggs' plan: Have the city bring on another lawyer — Michael Harrington — to hire Cappel. Since they'd all be serving the same client, they'd all be protected under the same legal umbrella. That would allow Cappel to see confidential documents without worrying about breaching the city's attorney-client privilege. At the city council meeting last week, Beggs laid out a multistage plan. Stage 1: Cappel would finish her initial investigatory report, without having access to the confidential documents. Stage 2: Harrington would hire Cappel, allowing her to read the documents that had been denied to her. Cappel would produce a second supplemental report, having seen the previously secret documents. Stage 3: Mayor David Condon and the city council would read the report and decide if they're willing to waive the city's privilege, in order to show it to the public. The city council approved Beggs' proposal, with Council President Ben Stuckart adding an extra threat: If the mayor didn't agree to Beggs' plan, Stuckart would refuse to sign additional checks for the attorney defending the city against Straub's lawsuit. The hurdles: Condon hasn't exactly leapt at Beggs' idea. Originally, Beggs says, the joint committee's plan was to have Harrington hired by May 1. Due to skepticism from the Condon administration, that didn't happen. "He's still considering the option," city spokesman Brian Coddington said last week.